The ‘Cardiac Surgery Score’ (CASUS) was developed by us in 2005 as a tool for daily risk stratification in patients admitted to the intensive care unit (ICU) after cardiac surgery . It was recently validated in a population of 6007 patients . The score is a simple additive model in which points are allocated for dysfunction of 6 organ systems with the total number of points providing an estimated risk of mortality (range 0-40). The CASUS can be easily calculated without need of computers. However, although simplicity is an important facet of a scoring system, accuracy should not be compromised. The increasing availability of information technology at the patient’s bedside encouraged us to develop a logistic version of the CASUS (Log-CASUS). Although we used sophisticated statistical methods to develop this system, our goal was to create a relatively simple model that no longer gives a single point value, but converts this to a percentage risk of mortality after cardiac surgery. Two specific questions were then addressed: First, is the new Log-CASUS a better overall predictor of mortality after cardiac surgery than the established additive CASUS? Second, are there any differences in daily ICU practice between the two models? The study included an evaluation of prospectively collected data of all consecutive adult patients admitted to our ICU after cardiac surgery between January 1st 2007 and December 31st 2009 to create the logistic version of the CASUS. It was approved by the Institutional Review Board of our university (approval number: 2809-05/10). We considered only the first admission for patients who were readmitted to the ICU during the study period. Demographic and laboratory data were collected from our quality control system QIMS 2.5 (University Hospital of Muenster, Germany) and from our intensive care information system COPRA 5.24 (COPRASYSTEM GmbH, Sasbachwalden, Germany), which is interfaced with the patient monitors (Philips IntelliVue MP70, Amsterdam, Netherlands), ventilators (Draeger Evita IV, Luebeck, Germany and Hamilton Galileo, Bonaduz, Swizerland), blood gas analyzing devices (ABL 800Flex Radiometer, Copenhagen, Denmark) and the central laboratories. The attending physician collected the data for the entire population. Two assigned medical clerks validated the data collection daily. A senior consultant performed a second periodical validation. Inconsistency between the evaluators was resolved by consensus. There were no missing data. Outcome was defined as ICU mortality. The calculation of both CASUS scores is based on the most abnormal value for each variable per day. The Log-CASUS provides an individual percentage of predicted mortality from a logistic regression equation. Predicted mortality = ℮ (β0 + ∑βi * Xi) / (1 + ℮ (β0 + ∑βi * Xi)) where β0 is the constant of the logistic regression equation and βi is the coefficient of each specific variable Xi (Table 2). 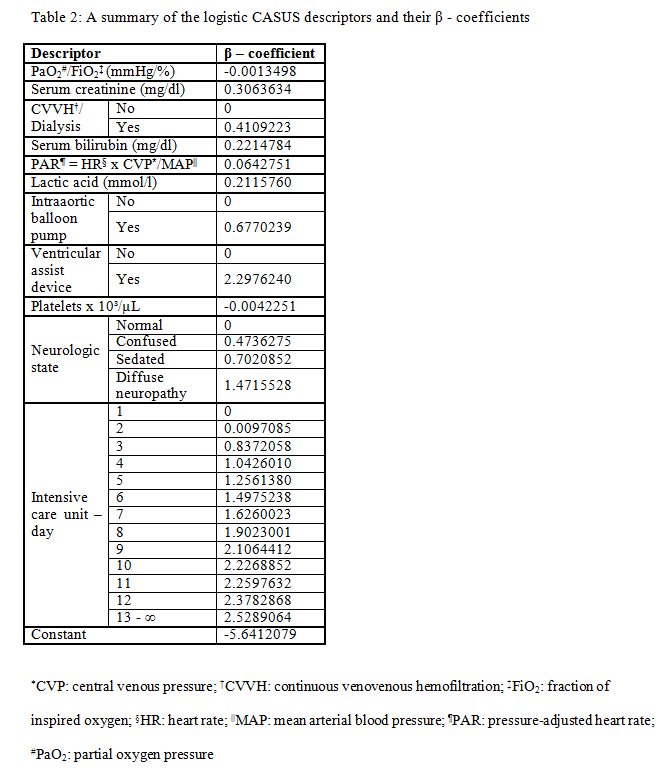 Xi corresponds to the patient’s data value for the six continuous variables (partial oxygen pressure/fraction of inspired oxygen, serum creatinine, serum bilirubin, pressure-adjusted heart rate, lactic acid, platelets), with Xi = 1 for the five categorical variables (continuous venovenous hemofiltration/dialysis, intraaortic balloon pump, ventricular assist device, neurologic state, ICU-day), which are connected to specific βi coefficients (Table 2). We integrated a new variable (ICU-day) (Figure 1) into the logistic score to take into account the negative effects of a prolonged ICU stay on survival. All analyses were performed using SPSS software version 18 (SPSS Inc, Chicago, IL, USA). The graphics were constructed using SigmaPlot software version 11.0 (Systat Software Inc, San Jose, CA, USA). Continuous scale data are presented as mean ± standard deviation and were analyzed by the two-tailed Student’s t-test for independent samples. A value of p < 0.05 was considered significant. Discrimination (ability of a scoring model to differentiate between survival and mortality) was evaluated with receiver-operating-characteristic (ROC) curves, which plot the sensitivity (true positive) against 1-specificity (false positive). Comparison of ROC curves was performed using the method of DeLong et al. . The area under the curve (AUC) indicates the discriminative ability of parameters, which means the ability to discriminate survivors from non-survivors. An AUC of 0.5 (a diagonal line) is equivalent to random chance , whereas an AUC of 1.0 implies perfect discrimination . Overall correct classification (OCC) (the ratio of correctly predicted survival and mortality to the total number of patient) values were calculated. Calibration was analyzed according to Anderson and Grunkemeier  as the difference between the actual observed (O) mortality and that predicted (expected) (E) by the model (O/E). Statistical analyses were performed from ICU day 1 (operative day) (n = 4054) to day 13 (n = 269). This study included 4054 ICU patients admitted over a period of three years, 29% (n = 1175) were female. Mean age was 67.2 ± 10.9 years (range 19-89 years). Mean length of ICU stay was 4.6 ± 7.0 days (range 1-189 days, median 2.0 days, 75th percentile 4.0 days) and ICU mortality was 5.8% (n = 235). The preoperative mean additive EuroSCORE was 6.3 ± 3.7 (median 6.0, 75th percentile 8.0) and mean logistic EuroSCORE was 9.9 ± 12.9 (median 5.3, 75th percentile 11.4). The total number of 4054 operations is allocated as follows: coronary artery bypass grafting 2144 (52.9 %); isolated valve surgery 923 (22.8 %); combined CABG & valve surgery 538 (13.3 %); aortic surgery 254 (6.2 %); cardiac transplantation 42 (1.0 %); others including congenital, cardiac tumors, pulmonary embolectomy, assist device implantation 153 (3.8 %). Table 3 summarizes the overall correct classification, the discriminatory power, AUCs, and the calibration of the two CASUS models. Both systems had good discrimination on all days with AUCs of ≥ 0.874 for the logistic and ≥ 0.865 for the additive model; the best results were on day 2 (additive: 0.966; logistic: 0.963). 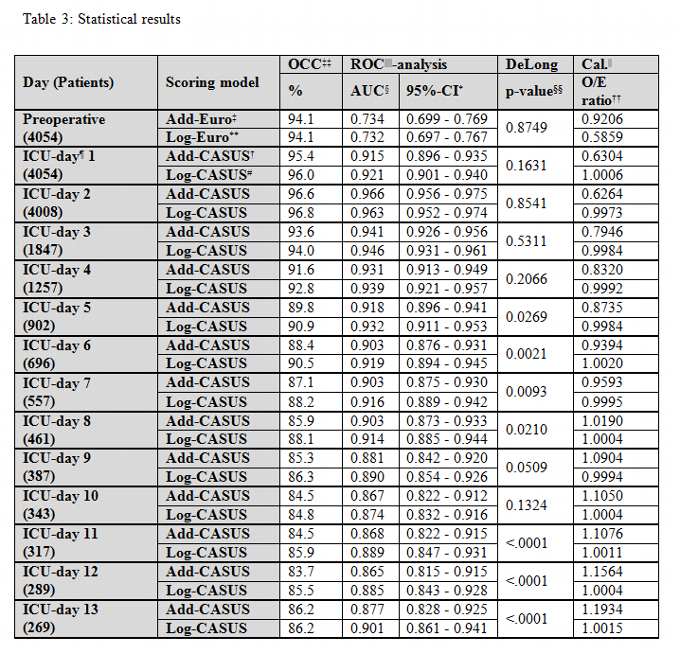 The DeLong method showed a significant p-value in favour of the logistic model on ICU days 5-7 and 11-13. The best OCC levels were on the second day (logistic: 96.8 %; additive: 96.6 %). The calibration of the logistic model was excellent for all days (Table 3, Figure 3). The additive model overestimated the risk of mortality during the first week in the ICU, but underestimated it from days 9 to 13. The β-coefficient for the ICU-day showed a steep increase until ICU-day 13, after which it remained stable (Figure 1). No gender-based differences were present. Cardiac surgery patients show temporary adverse effects and pathophysiological consequences related to the heart-lung-machine [7, 8], which can influence the values used in postoperative scoring systems . Such temporary effects include the relatively long duration of mechanical ventilation needed to stabilize these patients [10, 11] and the postoperative sedation which limits application of the Glasgow Coma Scale as a prognostic parameter . The additive CASUS  was proposed as a specialized scoring system which took into account these particular circumstances of the post-cardiac surgery ICU patient. The aim of this study was to assess whether the accuracy of the additive CASUS could be improved in a new logistic model. Why do we need a logistic scoring model? Interest in measuring mortality and outcome in patients undergoing cardiac surgery is increasing . The advantage of the new Log-CASUS model can be illustrated on two examples. First we use the data from two patients in our cohort. Both patients had an additive CASUS of 11 points after isolated valve surgery. Patient A was admitted to the ICU three hours after surgery, sedated and intubated (oxygenation index: 160). Lactic acid level was elevated (11.1 mmol/l) and the platelet count slightly low (97 x 10³/ µL). Heart rate was 90 bpm, with a central venous pressure of 13 mmHg and a mean arterial pressure of 62 mmHg. There was no evidence of hepatic or renal dysfunction. Patient B had already spent 17 days in the ICU. During the ICU stay the patient had developed multiorgan dysfunction and was on renal replacement therapy with elevated serum creatinine (1.58 mg/dl) and serum bilirubin (12.75 mg/dl) levels. This patient was extubated, showed no evidence of neurological or hematological dysfunction and had normal lactic acid levels (1.5 mmol/l). The patient’s heart rate was 111 bpm, central venous pressure 18 mmHg, mean arterial pressure 68 mmHg. Although the patients had the same additive CASUS, using the Log-CASUS, patient A had a risk of mortality of 18% and patient B of 68%. Most surgeons intuitively know that combining the risk factors of, for example, lactic acid of 28,5 mmol/l after a two weeks ICU-stay would result in a situation of virtually zero survival yet additive CASUS would only reflect the mortality risk as 4 points out of 40 for such a patient. The Log-CASUS on the other hand, gives a more realistic prediction of an 82.6% mortality rate. The main weakness of the additive CASUS scoring system is that it does not reflect ICU length of stay. Many organ dysfunctions develop later during the ICU stay, particularly among elective surgical patients who are often free of global organ dysfunction when admitted to the ICU . The number of failing organs and the degree of their dysfunction correlates well with an increasing mortality risk [15, 16]. The new Log-CASUS predicts risk of mortality from weighted organ dysfunction variables from the additive model and a weighted coefficient for the length of ICU stay. A high mortality risk in an individual patient can help alert physicians, especially young residents with limited experience, to the likely risk of complications. A premature discharge to the normal ward endangers a patient, which still need an adequate ICU-care. The Log-CASUS could guide as an objective parameter in the discharge decision. That limits the complications of ICU-readmission and subsequent prolonged hospital stay; both lead into a higher mortality [17, 18]. No scoring system can replace clinical evaluation at a patient’s bedside; they can only serve as an objective tool in decision making. Although scoring systems may provide an indication of disease severity and prognosis in individual patients they are designed for use in groups of patients and should never be the sole basis for therapeutic decisions. Therefore we strongly advise not to withdraw therapy based on a high score in an individual patient, because scoring systems are only accurate for a group of patients and decisions in the ICU should be made individually. Anderson et al. proposed that the O/E-ratio should be used for qualitative calibration , and this method has been used to compare different additive and logistic EuroSCORE sub-groups . Jin et al reported that the additive EuroSCORE gave larger O-E differences than the logistic model in high-risk patients . We similarly showed that the additive CASUS overestimated mortality on ICU days 1-7 and underestimated it on ICU days 9-13. Both CASUS models had strong discriminative power, but the logistic model was superior after the fourth ICU-day. The superiority of the Log-CASUS in calibration and discrimination is not surprising. The variables used in the CASUS impact to different extents on outcome, which cannot be reflected by a simple point system. For example, the presence of a ventricular assist device or of an intraaortic balloon pump scores 4 points in the additive CASUS, but in the logistic model they have different β-coefficients (ventricular assist device: 2.2976240; intraaortic balloon pump: 0.6770239). Furthermore, the logistic model includes the risk related to prolong ICU-stay. The presented results of this single centre study are based on a population of only 4054 patients. An external validation of the Log-CASUS in a large multicenter population is strongly recommended. The Log-CASUS is the worldwide first logistic model for daily risk stratification in postoperative ICU patients. In contrast to an additive model a logistic score offers a precise and realistic percentage of mortality for a given ICU-day. A defined percentage has a clear advantage in the communication with patients and relatives, which are generally not familiar with risk models. We believe that no scoring system can replace clinical evaluation and therapy should never be withheld on the basis of a score alone. They can only serve as an objective tool in daily ICU decision making. The Log-CASUS can be easily calculated at the bedside using a personal digital assistant (e.g. i-Phone-Applet). 1. Hekmat K, Kroener A, Stuetzer H, Schwinger RH, Kampe S, Bennink GB, et al. Daily assessment of organ dysfunction and survival in intensive care unit cardiac surgical patients. Ann Thorac Surg 2005;79:1555-62. 2. Hekmat K, Doerr F, Kroener A, Heldwein M, Bossert T, Badreldin AM, et al. Prediction of mortality in intensive care unit cardiac surgical patients. Eur J Cardiothorac Surg 2010;38:104-9. 3. DeLong ER, DeLong DM, Clarke-Pearson DL. Comparing the areas under two or more correlated receiver operating characteristic curves: a nonparametric approach. Biometrics 1988;44:837-45. 4. Bewick V, Cheek L, Ball J. Statistics review 13: receiver operating characteristic curves. Crit Care 2004;8:508-12.
cancer patients - a review. Crit Care 2005;9:458-63. 6. Anderson RP, Jin R, Grunkemeier GL. Understanding logistic regression analysis in clinical reports: an introduction. Ann Thorac Surg 2003;75:753-57. 7. Ryan TA, Rady MY, Bashour CA, Leventhal M, Lytle B, Starr NJ. Predictors of outcome in cardiac surgical patients without prolonged intensive care stay. Chest 1997;112:1035-42. 8. Turner JS, Morgan CJ, Thakrar B, Pepper JR. Difficulties in predicting outcome in cardiac surgery patients. Crit Care Med 1995;23:1843-50. 9. Weiss YG, Merin G, Koganov E, Ribo A, Oppenheim-Eden A, Medalion B, et al. Postcardiopulmonary bypass hypoxemia: a prospective study on incidence, risk factors, and clinical significance. J Cardiothorac Vasc Anesth 2000;14:506-13. 10. Kollef HM, Wragge T, Pasque C. Determinants of mortality and multiorgan dysfunction in cardiac surgery patients requiring prolonged mechanical ventilation. Chest 1995;107:1395-1401. 11. Rady MY, Ryan T, Starr NJ. Perioperative determinants of morbidity and mortality in elderly patients undergoing cardiac surgery. Crit Care Med 1998;26:225-35. 12. Marik PE, Varon J. Severity scoring and outcome assessment. Computerized predictive models and scoring systems. Crit Care Clin 1999;15:633-46. 13. Bhatti F, Grayson AD, Grotte G, Fabri BM, Au J, Jones M, et al. on behalf of the north west quality improvement programme in cardiac interventions. The logistic EuroSCORE in cardiac surgery: how well does it predict operative risk? Heart 2006;92:1817-20. 14. Le Gall JR, Klar J, Lemeshow S, Saulnier F, Alberti C, Artigas A, et al. The Logistic Organ Dysfunction System: A New Way to Assess Organ Dysfunction in the Intensive Care Unit. JAMA 1996;276:802-10. 15. Herbert RC, Drummond AJ, Singer J, Bernard GR, Russel JA. A simple multiple organ system failure scoring system predicts mortality of patients who have sepsis syndrome. Chest 1993;104:230-35. 16. Rauss A, Knaus WA, Patois E, LeGall JR, Loirat P, the French Multicentric group of ICU research. Prognostic for recovery from multiple organ system failure: the accuracy of objective estimates of change for survival. Med Decis Making 1990;10:155-62. 17. Chung DA, Sharples LD, Nashef SAM. A case-control analysis of readmissions to the cardiac surgical intensive care unit. Eur J Cardiothorac Surg 2002;22:282-86. 18. Michalopoulos A, Stavridis G, Geroulanos S. Severe Sepsis in Cardiac Surgical Patients. Eur J Surg 1998;164:217-22. 19. Shanmugam G, West M, Berg G. Additive and logistic EuroSCORE performance in high risk patients. Interact Cardiovasc Thorac Surg 2005;4:299-303. 20. Jin R, Grunkemeier GL. Does the logistic EuroSCORE offer an advantage over the additive model? Interact Cardiovasc Thorac Surg 2006;5:15-17.